This the necessary post for testing the SOF_ASSESS application. This is a prototype app that will drive the answering of questions on Stack Overflow. Many Developers, IT and technical staff are assessed for employment each day. These assignments/assessments usually end-up in a private file, or worse, the circular administration container. 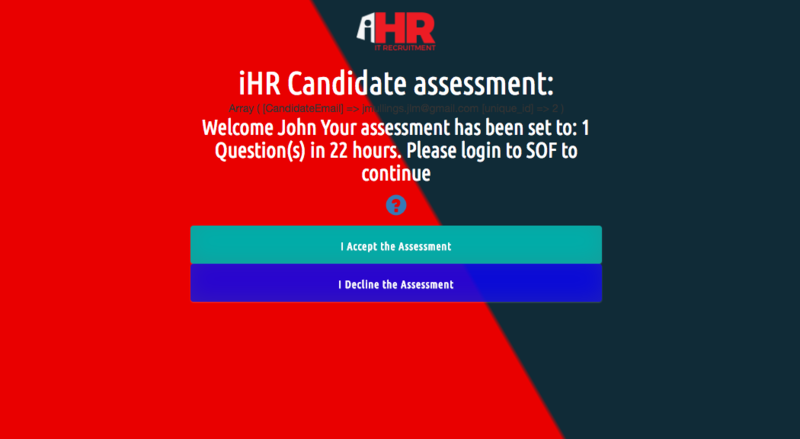 This App is to be deployed to make use of effort being afforded to these assessments, providing new perspectives to questions asked and ultimately raising the bar on both HR and IT Recruitment. The application (when complete) can be found at www.ihr.co.nz/assess and will be a free and open to all to use. You can assess your own abilities or others. This application has been developed by Jason.Mullings@ihr.co.nz and is under continued development. Why not just use Stack Overflow? Once the assessment has been completed, the resulting data will be compiled, analyzed and compared against the collective repository. Coupled with additional testing features, the site will provide a comprehensive reporting tool for both highly technical assessors and the laymen HR Advisor. Integration will be allowed at no charge! Web based application (API to follow). Browse other questions tagged app placeholder .